Recently I was at a customer who used the MSF for Agile Software Development template in Team Foundation Server 2012. As he was doing Scrum with this template he had the need to show Bugs in the Product Backlog view as well. Just like User Stories he wanted to plan bugs in a specific sprint. Seems logical but Bugs did not show in the Product Backlog view. When I checked a little bit further, it seems that the MSF for CMMI template only shows [Requirement] work items and the Scrum template showed [Product Backlog Item] and [Bug] Work items. The most obvious option was to press the [Create Backlog Query] button on the Product Backlog, but that only gave the possibility to save the underlying query in the Team Project. Because I could only find some forum answers I decided to create a blog post on how to modify the Product Backlog view in the TFS 2012 Web Access Client. It is somewhat more complicated than one would expect. Before I start my explanation on how to modify the Product Backlog, I want to explain a little bit about the underlying concepts. This contains work item types that are considered a Bug. When you use Test Manager it creates the Work Item Type that is the default of this category. This contains work item types that are considered as the ones to use when performing Code Reviews. When you submit a Code Review Request in VS 2012, the default work item type for this category is created. This contains work item types that are considered as the ones to use when using the Feedback tools in VS 2012. When you submit a Feedback Request in VS 2012, the default work item type for this category is created. This contains all work item types that are considered as a requirement. In Scrum this is the [Product Backlog Item] and in CMMI this is the [Requirement]. This contains the work item types that are considered to be a Test Case. When using Test Manager and adding new Tests, the default work item type in this category will be used. As you can see, a category can contain multiple work item types, and always 1 default type. Now we know a bit more about categories, we can dive into the Product backlog. As I mentioned at the start of this post, the button [Create Backlog Query] only gives you the possibility to save the backlog query but not modify the query that is used for the backlog. Still, this is very useful information, because it provides us with valuable information about the data that is used in the Product Backlog. As we can see in the query for the Agile Template, the product backlog shows us all Work Items from the Requirements category in the states New, Active and Resolved. I will work out an example where we are going to change the Product Backlog of an MSF Agile project so that it shows User Stories and Bugs and show the Area Path in the output columns. 1: witadmin exportcategories /collection:http://<server>:8080/tfs/DefaultCollection /p:"<ProjectName>" /f:"FileName.xml"
1: witadmin importcategories /collection:http://<server>:8080/tfs/DefaultCollection /p:"<ProjectName>" /f:"FileName.xml"
TF400917: The current configuration is not valid for this feature. This feature cannot be used until you correct the configuration. This means that there is something wrong with the configuration. The categories configuration however is fine. The error is located within the [Bug] Work Item. This item does not contain the fields that are necessary for the Requirements field. Add the Story Points field (exactly the same as the one on User Story) to the [Bug] Work Item. 1: witadmin exportagileprocessconfig /collection:http://<server>:8080/tfs/DefaultCollection /p:"<ProjectName>" /f:"FileName.xml"
1: witadmin importagileprocessconfig /collection:http://<server>:8080/tfs/DefaultCollection /p:"<ProjectName>" /f:"FileName.xml"
The states that are used in the query, are extracted from the meta states that are defined for the project. 1: witadmin exportcommonprocessconfig /collection:http://<server>:8080/tfs/DefaultCollection /p:"<ProjectName>" /f:"FileName.xml"
This file contains information about the meta states that are used. When you follow these steps, you can modify how your Product Backlog looks and works ! But can I also change the actual query? I don’t want to see work items with State=New from sub-iterations in my Product Backlog. I only want to see those that are not yet assigned to iterations. I modified the Product Backlog with export/import commonprocessconfig but the new columns do not allow me to set the WIP limits. Did I miss something? You can set wip limits on the kanban board. This is another view that cannot (is coming in update 2) be customized. The view is only available in tfs 2012 update 1 and higher. I can set the WIP limits on the standard columns but when I added the new one I cannot set the WIP limits – they don’t show at all. Figured I missed something. I did set it to an “InProgress” column. The kanban board is shown on the Product Backlog page. This board does not use the meta states but the “real” states of the Product Backlog Item. Take a look at this post how it works! I am trying to add a custom WI to the Product Backlog page. 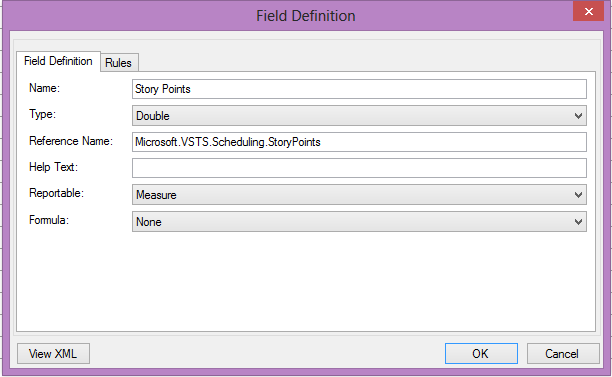 VS 2012 TFS 2012 AGILE 6.2. I have been having all kinds of trouble so I thought I would try something simple. 3) Save and import and verify work item functions. I’m missing some data in your answer. Point 1 and 2 probably contain a image. Can you provide that again please? No, no image, however I do have an update. Steps 1 & 2 were outlining the steps I used to create a work item called “Work Set” which was a copy of the default “User Story” work item with only the name changed. For full disclosure had been making changes to the catalog, process definition files before doing steps 1 and 2, but even with the changes I had made the User Story still correctly showed in the back log but my new Work Set work item generated the error when added ot the backlog. After making my original post I got frustrated and went back to square one with default configurations restored. I then repeated steps 1 and 2 and this time my new work item, “Work Set” appeared just as I expected it to. I guess now my questions turns to one of how to debug problems in the configuration. Backing out to square one doesn’t seem to be very efficient. Is there some log somewhere that can be viewed or some other tool for validating configurations? When you say, “Open the XML and change the following element”, what specifically are you changing? Please specify. Hello, have you ever experienced a case where you export the agile config, make the changes, import the config back but no changes were applied? When I export the config again I see all my changes but the additional columns are not visible on the web. It’s driving me insane. The agile config is the only one giving me trouble. I have successfully made change to the categories.xml and the commonprocessconfig.xml. If you are on TFS 2013 , the agileprocess config is replaced with processconfig. If not, have you tried to reset IIS or delete the tfs cache? Thank you for this post. I’m using it 3 years later and face same problem. I have resolved it following your guideline. Though I have one question. Have you notice that the bug that are now appear on the backlog, if their iteration is set to the current one, they just disappear from the backlog list. In 2012 ? I cannot remember :). Currently you can choose to show the “in progress ” items or not. Thanks for your comment ! We can change it in TFS 2015? or in 2012? Sorry I’m still maintaining an old server that is still running 2012.
how can we change in TFS 2012 which state we want the Backlog to display?